Governor Janet Mills speaks at a news conference in the State House, Wednesday, Feb. 6, 2019, in Augusta, Maine. Mills is accompanied by Department of Corrections Commissioner Randy Liberty, left, Director of Opioid Response Gordon Smith, second from right, and Department of Health and Human Services Commissioner Jeanne Lambrew. Mills later signed an executive order directing immediate action on the opioid epidemic. Gov. 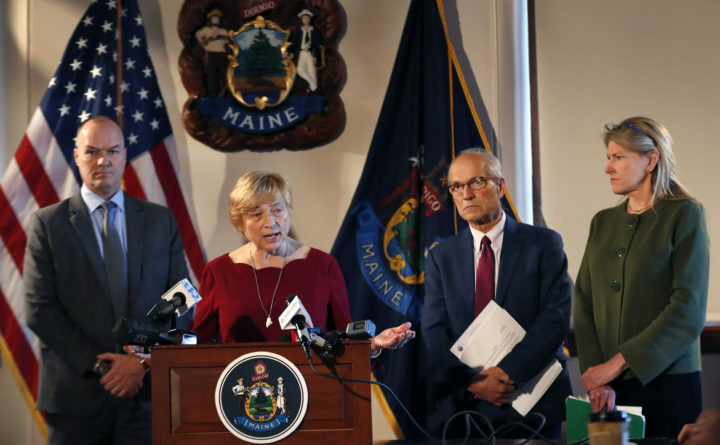 Janet Mills put Maine on a new path to solving the state’s deadly substance abuse epidemic last week by focusing on concrete steps that will prevent overdose deaths in the short term and increase access to treatment in the long term. Not only are the new policies and programs aimed at helping Maine people — and important move away from derision and punishment — but they are also based on scientific assessment of what works best to support and help people with substance use disorder. This new direction is long overdue. But, it won’t be effective without support — especially when it comes to spending state money — from the Legislature, which must be a partner in this work. Mills signed an executive order Wednesday that sets a new course, but also commits the state to immediate action. She followed up Friday with a budget proposal that includes funding to raise reimbursement rates for medication-assisted treatment and to lift the current two-year cap on this treatment for low-income Mainers. The executive order sets aside $1.6 million in existing state and federal funds to buy 35,000 doses of naloxone, an overdose-reversing drug, to distribute throughout the state and to train 250 recovery coaches to be in hospital emergency rooms. Recovery coaches — who are usually volunteers — can help develop a recovery plan and connect a patient to services in their community, which are critical steps after someone with substance abuse disorder leaves the hospital. The order’s emphasis on medication-assisted treatment, especially in correctional settings, is also a big step in the right direction. More than two-thirds of people in U.S. jails and prisons meet the medical criteria for substance abuse or addiction. Medication-assisted treatment, which includes Suboxone and methadone often in combination with counseling and behavioral therapies, has decades of research backing its ability to decrease opioid use, opioid-related overdose deaths, criminal activity and the transmission of infectious diseases. Currently, inmates at the Maine State Prison and many county jails are prohibited from continuing medication-assisted treatment while they are incarcerated. This disrupts their treatment, and according to the ACLU of Maine, violates their constitutional rights. In addition to helping some inmates continue their treatment, reversing these policies will extend a proven treatment to additional Mainers. Beyond the order, Mills pledged to push to raise reimbursement rates for treatment providers and to end the current two-year cap on medication-assisted treatment for those covered by MaineCare, the state’s public health insurance program. Both will require legislative action, but both are essential to tackling the state’s deadly substance abuse epidemic. Maine law generally limits Medicaid to covering two years of methadone and Suboxone treatment, and Maine’s Medicaid program pays among the lowest reimbursement rates in the nation for methadone. In addition, reimbursement for a range of substance use disorder and mental health treatments has remained at the same level for more than a decade. As a result, between 25,000 and 30,000 people in Maine want to enroll in a recovery program but cannot access one, according to the Substance Abuse and Mental Health Services Administration. On a single day in 2015, fewer than 5,300 people were being treated with either methadone or Suboxone, the two most common medications used to treat opioid addiction, the federal agency reported. With her executive order, budget proposal, recommended policy changes, appointment of a director of opioid response, and creation of a Prevention and Recovery Cabinet, Mills is giving this crisis the attention required to ease its deadly grip. Sustained action must follow.